You have heard the saying "necessity is the mother of invention". Have you ever wanted a beautiful sliding barn door and the only thing on the market is ho hum or your builder had to make one for $300 out of some pine boards on the jobsite? Still not very pretty? If you are like me, you searched the entire Internet and could not find any sliding barn door that had hand carving or was elegant. Search no more. Swede Collection introduced at April High Point market its first three elegant barn doors. Nobody but Swede is making these. There are more designs in the works for October High Point market including a very interesting one you could call Bohemian with lots of details. Want an elegant sliding door between the master bedroom and bath? How about one of these? Also incredible in a dining room. This one is Silvermist blue with hand carving and Italian silver leaf. And it is finished on the back side as well. Italian silver leaf on the trim. Lovely from both sides. Have a white room and need an elegant white sliding door? Here she is. Hand carved a couple feet from the top down. The back side is painted white also. Due to the depth of the door the carving can only be on one side. How about the elegance of this one in Serious Gray with Italian gold leaf on both sides. Back is the same as the front on this one. Sizes??? These three are 8 foot 4 inches tall and 39 inches wide. They fit an 8 foot interior door that is either 32 or 36 inches wide. Can't wait to show you the new ones being developed now. They also come in 88 inches high for either 7 foot interior doors or 6'-8" openings. Pass the word. Pretty barn doors now exist. Webmaster is putting them up on swedefurniture.com this week. I am home from showing my line at October High Point market. Here are the new products I introduced. 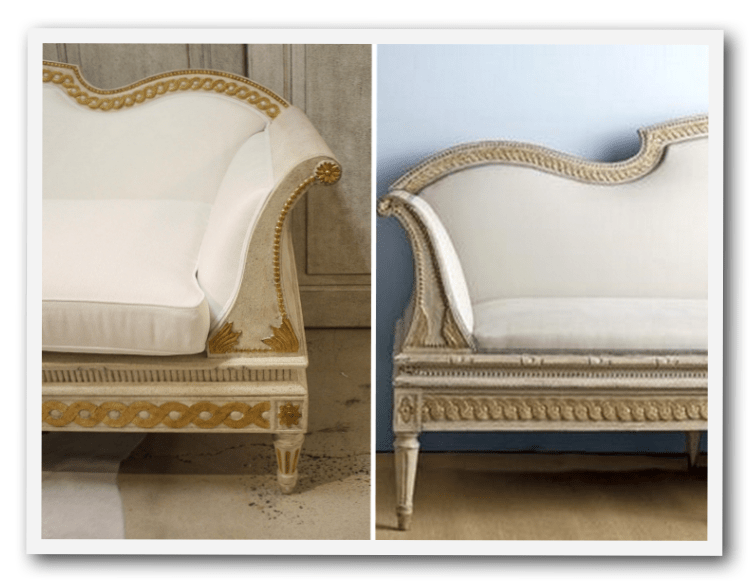 Gustavian sofa with Italian silver leaf accents. We showed this before with Italian gold leaf. Gustavian 20 inch stools in three colors. This one is Silvermist with Italian silver leaf accents. Here it is in Acacia with Italian gold leaf. And this one is textured grey with no leaf. Pairs of this demilune table which combined make a 44 inch round dining table. This is a textured grey finish. French desk in solid Ash with a cerused finish. SC0037 Rolling Coin occasional chair in Silvermist and Italian silver leaf finish. These panels are for interior shutters on windows or doors. This particular set is 10 feet tall and 2 feet wide per panel. We are also making them into elegant hand carved sliding barn doors with Italian silver leaf for spring market in April. Beautiful in a master bedroom between the master and bath areas. I have been suffering with Plantars Facitis in my right heel so doing market wasn't much fun. It has improved a bit from when I couldn't walk on my right foot at all. Hope you enjoy what Swede Collection is making. Here is a sneak peek at one of the pieces we will be showing in a couple weeks at High Point October market. This Swedish Gustavian stool is being introduced in three colors, Silvermist, Grey Texture and Acacia. Photos are taken on the loading dock as I was in a hurry to see them. Formal photos will be taken in October. These stools are 20 inches wide/deep so a man can sit on them without the fear they will collapse like delicate ones could. Solid Maple with Italian silver and gold leaf on two of them. Grey one is plain. Made 19 inches high so they can be used as seating on the side of a dining table in place of chairs. More new pieces to come ----. I will also be showing a new desk and Swedish demilune tables. Here is my table. So many shades of red and berrry: Cranberry, raspberry, puce, aubergine, strawberry and ruby. In this tablescape for Valentine's Day, I pulled out of the cupboards a lot of red-ish plates and stemware. I think I got the heart at Hobby Lobby as a Christmas ornament several years ago. When I Googled, it said the author was Simone Wood and the full quote is: "Love is an unconditional commitment to an imperfect person. To love somebody isn't just a strong feeling. It's a decision, a judgement, and a promise." With love being so hard to define, I like this one. I decided not to make fresh flower arrangements and just use items I had in the house like the white Orchids and seashell sculpture for the centerpiece. Antique Swedish Rococo cabinet from 1780. Swede Collection oval-back chairs. I used this white quilted boutis tablecloth because I like how the scallops touch the floor. Haviland charger in Laque de Chine Aubergine gold. These are new not antique. The appetizer plate for soft foods that don't scratch the painting on the plate. This porcelain cherub plate could be made by Nyon of Switzerland [1780-1860] from the fish symbol that is on the backside with no manufacturer's name. I call these my Florence Vanderbilt plates - set of 12. The dealer I purchased them from told me they belonged to a granddaughter of Florence Adele Vanderbilt Twombly [died 1952], who was one of nine children of William H. Vanderbilt. Apparently there was a large set of this china but by the time I found it only the dinner plates were left. According to the dealer, much of the set went to a man who collects Vanderbilt memorbilia. I did not buy them because of the V connection because I thought that was just sales talk, but checking into it further [I Googled and looked on Ancestry.com], I did find the last name of the seller [Burden of Connecticut] and it matched the family name on her family tree. That doesn't really mean the granddaughter got them from Florence. They could have come from another source or even the other side of her family. This is when I really wish antiques could talk and tell the story of their lives. A lot of times there is more fiction than facts to inflate an object's value. I know that I could never sell anything that I inherited from my Grandmother or GreatGM even if I was starving. This is Florence Vanderbilt painted in 1896 by John Singer Sargent. Do I really own her plates? Will never know. Salad plate is signed RB Boston. This color when it was popular was called puce. Lovely plates with the swirls, gold flourishes and hand painted flowers. Rim soup plate by Royal Worcester marked on the back 1885. Wonderful size at 10" across. Hubby made his fish chowder of shrimp, clams, mahi-mahi and vegetables. The dinner plates I think are vintage not antique. Made by Royal York of Germany. This color is more ruby or cranberry. Flatware is Ricci of Italy in the Raffaello pattern. It is gold plated stainless steel. I love the fish-scale design. These dessert plates are among my favorite china. Made by Spode Copeland and hand painted and signed by R. Wood. I call this color ruby. I am using three pieces of stemware. In front, William Yeoward's "Pearl", on left a Pottery Barn goblet with ruby stem, pattern name unknown, and on right, Varga's raspberry "Imperial". Napkin ring by Kim Seybert and Le Jacquard Francais napkin in Graphic Black Current. Thanks for visiting to see my tablescape. Simple white holiday table. I wanted to use as much white as I could without introducing another color. A "White Christmas" theme. Using what I have around the house, four silver reindeer with white fur collars, an abalone tree standing in "ice" glass garland and two white Orchids in white planters that I got this summer at a charity consignment shop. For china for this table I chose white with gold trim and gold plated stainless steel flatware. Thirty-two inch lapkins are from France with my husband's initials. Flatware from Ricci of Italy in Raffaello pattern. Antique rim soup is French Elite with monogramming done by William Lycett in Atlanta. Dinner plate is Admiral by Coalport. Quilted boutis tablecloth from Macy's has scalloped edge. Stemware left to right: William Yeoward's "Pearl", Simon Pearce's "Stratton" and William Yeoward's "Gloria". Oval back chairs from Swede Collection. Oushak rug. If you wanted to change this table up for another dinner the following day, it would be easy to add green plates and switch out the rim soups with an antique green fish plate. I switched the styling up in the family room on my Gustavian buffet for December's holiday decor. I moved my Swedish antique priest's box from the console on the other side of the room to sit on top of my enfilade buffet as the center focal point. I love white interiors any time of year, but I think they look especially nice at Christmas time even if you don't have snow. This is what it looks like close up. I found this in Sweden on my May 2014 trip. The color is a blue/grey so it fits in very nicely. Since it is in pretty good condition, it could have been in a private family in-home chapel rather than a church. Wish these items could talk as I would love to know more about it. A lot of very skilled hand carving went into making it. After Christmas this display would look just fine after removing the green trees and gold angel candleholders. I haven't thought yet about what to put on here for Spring. The wire brush trees have white on them. The white planters that the orchids are in I found at a charity consignment store. Perfect for sliding a potted plant inside. Brush trees from Target. In this angle view you can see my Swede Collection Gustavian oval-back chairs. Buffet and mirror are Swede Collection also. Rick helped me get the preserved boxwood wreath attached with a hook on top of the mirror. Couldn't have done it without his help. I decided not to put a bow on it and just leave it natural. The two gold angel resin candlesticks I purchased around 2000 from Bombay company before they closed their stores. In this view you can see at the left the Swedish antique column cabinet in the hallway with gold sunburst decor on top which is from Wisteria catalog. This is a close up view. I added the silver cross. I am using the column cabinet for wine storage. These cabinets are kinda rare in Sweden so I was very happy to find mine. I like how the different shades of grey all blend together. Got the garland on the stairs last Monday. Late but it is on. Here is a close up of the shatterproof ornaments in turquoise, aqua, lime and silver. The garlands are on double, one on each side of the railing for a fuller look secured with zip ties to not damage the wood. I think I used 14 six-foot garlands but lost track, it could be a couple more. Maybe I will count them when I store them in January. Just wanted to share with you what Swede Furniture pieces look like in a room. Here is the Lundby mirror over the Gustavian Enfilade Buffet. Accessories are aqua demi john jugs brought over from France and a French iron candlestand. The Lundby mirror is 66" high and goes to the top of the ten foot ceiling. The detail panel on the mirror is a lady riding in a cart pulled by a Swan and a cherub holding a torch. The original I found as a piece of plaster cove molding from Lyon, France that I had flattened and transferred to make this piece. I placed it at the bottom of the mirror rather than the top so people could see it more easily. I am so proud of the skill and talent of the men and women who carve and construct these pieces. Just finished on November 10th. A king bed with upholstered headboard so you can sit up in bed and read or watch TV. Has a gold crown removable canopy for a little flare. Shown is the pale silver mottled finish which I think is just heavenly-cloud like. Made of iron and steel with center support for box springs. Should last 400 years. I am in the works of creating three options for the crown so people have some choices. Posts are 92" tall and crown is at 102" tall so it will fit in a room with 9 foot ceilings. Just love creating new products. So fun. Swede showed 13 pieces at High Point Market last week. 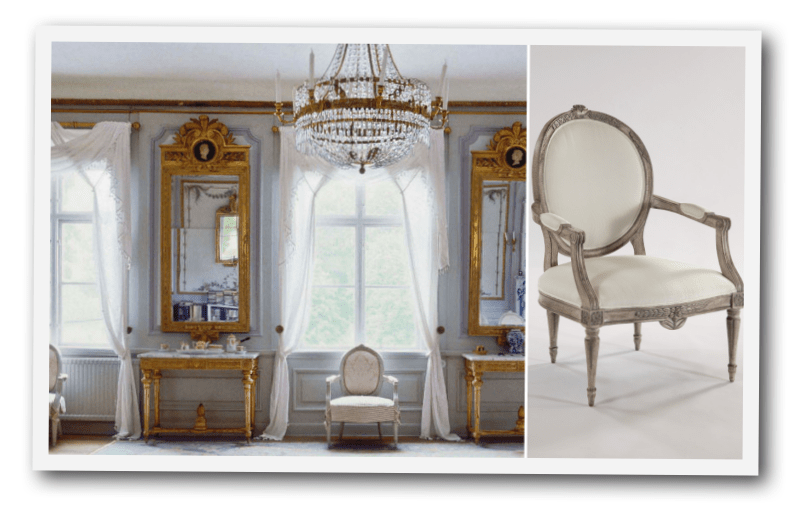 Eight chairs, two tea tables, a Gustavian buffet and two mirrors. Here is a photo of one side of the booth. The florescent lights were just horrible for taking any decent photos. Next time I will remember to take Dr. Scholl's shoe inserts or wear tennis shoes as my back and feet were on fire in pain. Eleven hours of standing on my feet about did me in. I could hardly walk. It is all about getting your brand better known and learn what your customers want. Based on many buyers wanting unfinished chair frames, I'm going to change my business model with a new product line before April market. I am taking 13 newly finished pieces to October High Point market. My fabulous paint finish designer created some incredible paint finishes for these new pieces. If you are attending market, please come see me at The Suites at Market Square, space 1-805. Top floor near the escalators. All of my pieces are designed to flow seamlessly in a room with Swedish antiques. Next to each other, you can hardly tell the difference. A classic Gustavian buffet. I'm in love with this piece. Six legs and curved ends. 60" long, 39" high and 21" deep, four doors, two drawers and finished in pale grey with silver leaf on the top trim. I am definitely keeping one of these for my house. It looks so great with some of my antique Swedish cabinets. I named this occasional chair Sabylund after Sabylund Manor, a beautiful home two hours from Stockholm built in 1787 and still occupied today by the same family. Chairs almost identical to these are in the manor. You can also see them in the Nov/Dec 2011 issue of Veranda magazine. I have three favorite chairs and this is one of them. Hand carved in maple with 8-way hand-tied springs in the seat. This is a curvy Rococo chair. I brought back this newborn's ancestor from Sweden on my last trip and my guys hand carved it exactly in maple. I designed some brass fleur de lis braces for the back so it could be removable to switch out the back fabric when you want a change of design or color for an event or holiday without having to remove the front fabric. Here is another reproduction of an antique chair I brought back from Sweden. I made this one in two sizes, a dining room chair and an occasional living room chair. Hand carved in maple with a pretty grey finish. Of course you can order any finish you want. It would look fun in our aqua finish. I love how the carving comes off the back and turns and swirls to form the arm. This floor mirror is 94" tall and 43.5" wide. In textured creme and hand applied gold leaf. All the details are hand carved including the moldings which were hand carved in place. Antiqued mirror glass. This piece will look good 300 years from now. This triangular shaped sunburst mirror is hand carved in maple. No plastic here. Then silver leaf and gold leaf was hand applied. Mirror is antiqued glass. 41" wide at bottom and 39" tall. Another classic piece. We made another size in this oval back dining arm chair. This one is 26" wide at the seat so it is narrower to place on the sides of rectangular tables if you want arm chairs there instead of armless side chairs. We also make this one in 28" width for host chairs or for larger round tables. We also just finished this armless side chair in 24" width to save space along the sides of a rectangular table. All the oval-back chairs have eight-way hand-tied springs for comfort at long dinner parties. This one, too, is hand carved. We made this Rococo dining chair in a smaller size, so now you can choose between a large or smaller chair. We have the larger ones in our kitchen and just love them. My husband is very comfortable in it. This occasional or tea table was remade in a textured finish created by my fabulous paint guy from Indiana. This one got a new texturized finish as well. We made a few small changes to this wave rim chair also. 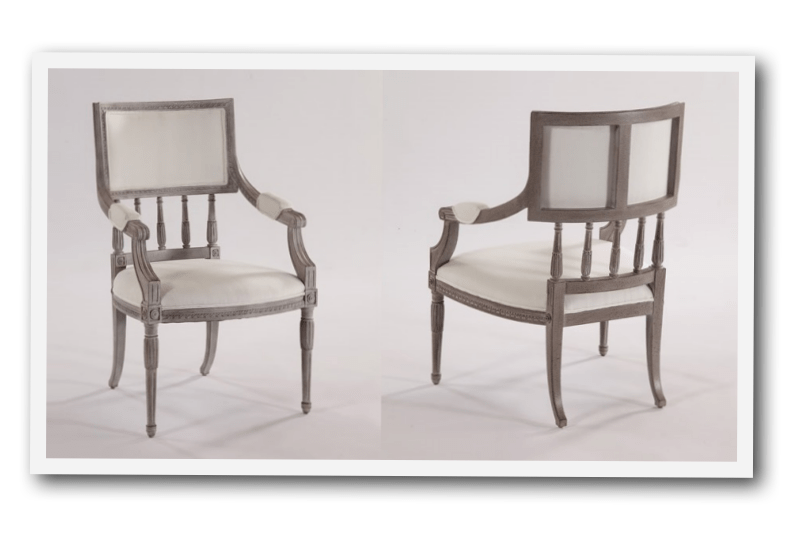 Here is the Gustavian occasional chair. It was made wider and deeper than the dining chair. All the detail you see here was carved by hand. I have a full line up of new pieces for the next April market. Always exciting to make new products. Lots of work go into making quality furniture so it will last for generations. Hope you like these. The Fourth of July is my five-year blog-iversary of my blog Swede here on Typepad. How time flies. After reading blogs for a few years I decided to share photos of things I found to be beautiful but wasn't sure I had anything to talk about that anyone would want to hear. As they say, to be successful at anything you just have to start and the path will open. So I did on July 4th, 2010 and have posted over 500 posts and have followers all over the USA and the world - England, Australia, France, etc. And, they are the greatest followers ever -- so kind and supportive -- love you all. I've slowed down on posts after spending too much time posting on Facebook!!! Today I want to share some of the first photos of that first blog post which was of the Statue of Liberty and Ellis Island. The day I was there the New York sky almost didn't have a cloud in it which makes the photos almost seem fake. My favorite shots are looking up from the top observation deck at the aqua patina of the metal of her dress, book and arm. Hope you enjoy. Love the folds in her dress. Other than distance shots from standing on the ground at the bottom, the only other way is to get a few shots from the observation decks. You can no longer go to the top. When I was in Paris, I also saw some smaller versions of this statue in parks. Not sure if they were the models for ours or not. I was very happy to have the opportunity to see her up close. And Ellis Island taken from the ferry boat that takes you over to the statue. Hope you are enjoying your holiday weekend. Many of you said you liked my prior posts on manly machines used in the manufacture of furniture, so I thought you might like to see more photos of the handmade side as well. There are so many steps and processes that all have to come together perfectly to make this quality of furniture. In this post I will talk about making carved chairs. Chairs are probably the most difficult product to design and manufacture so certainly take the most detailed time and attention in the process. I have an intense passion for making furniture and especially Swedish formal pieces. There is pure joy in bringing back to life a chair that a master craftsman made in the 1700's whose design cannot be improved upon. Now more people can enjoy owning such exquisite works and passing them down to more generations. 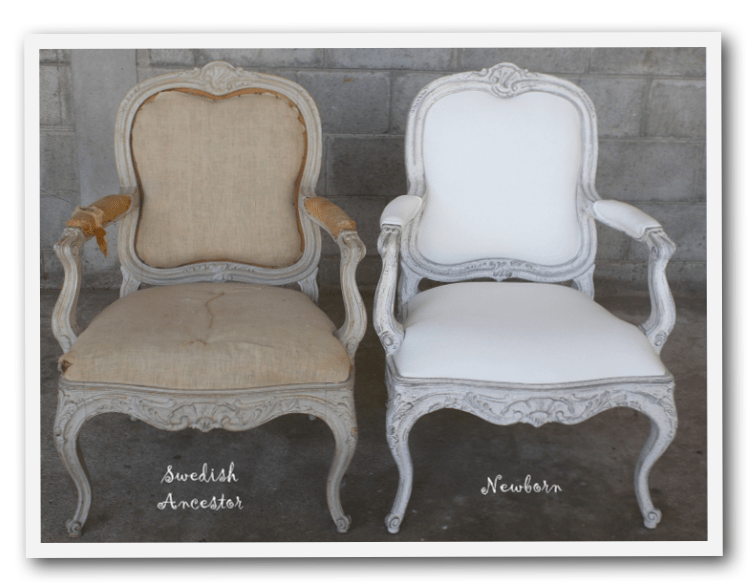 To get the end result of these beautiful Swedish Rococo chairs, you start, of course, with green lumber. Having arrived from the mill, these boards are put into a kiln and dried for about 30 days. This lumber is ready to be made into beautiful furniture pieces. Here these boards have been glued together and are being hand planed for that extra special touch. He can tell by the feel if it is just right. This duplicating carver machine will create a rough shape of the furniture part by eliminating all the extra wood that is not needed. The hand carvers will then use their skill and talent to put the details in. Here this highly skilled man is taking the rough carved piece from the machine and adding all the minute details of the pattern. He has to possess a lot of skill to know what knife to select, how hard to push down on the knife and at what angle. 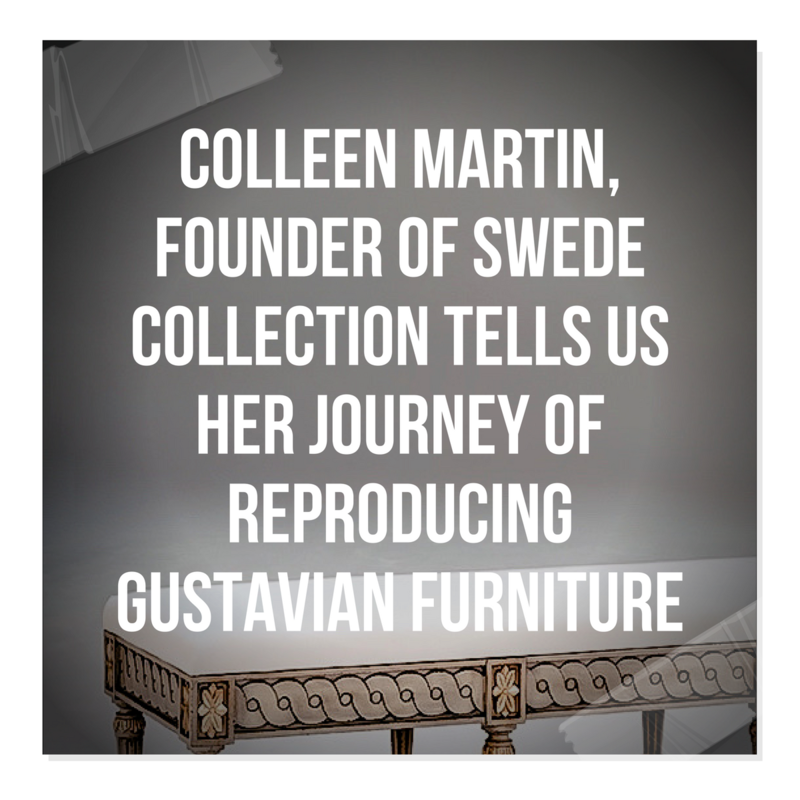 This is exactly what sets Swede Collection furniture apart from the others --attention to detail in the desire to make each piece lovingly the best. The first hours of the morning are spent by the carvers making sure their tools are perfectly sharp. Round pieces are made on a lathe where the wood spins at high speed while a knife is held up to it to cut excess wood away. The highly skilled person doing this has to have expert coordination of his eye and touch as a slip of the knife, using the wrong knife, or putting it in the wrong place ruins it. These people are perfectionists. Here this expert carver is doing all the hand carving on the top rail of the Rococo chair. There is no reason these Swedish chairs could not still be alive and well and loved 400 years from now. We are creating lasting inheritable furniture in classic designs that never go out of style. Here is what the chair top rail is looking like at this stage. A little more work still needs to be done. This is bench-made quality furniture. No detail can be missed. Quality of workmanship is the top priority. Every part of this chair is in perfect proportion. There are only a couple places where there is a straight line as nearly every part is curved - concave and convex. This lady is sanding a cabinet door. Due to all the small spaces and details, the chairs will all be sanded by hand - each and every curve. A few of the samples are waiting the paint finish process. In addition to the top rail carving, you can see here the detailed hand carving on the legs, epaulette knees, feet and seat rail. Even the stretcher is curved. There is a carved bird's eye on each hand grip at the ends of the arms. The splat back is curved to fit comfortably when you rest your back. I keep saying I am the luckiest woman in the industry to have such great talent working for me. My "paint guy" is exceptional in developing fabulous finishes for each design. 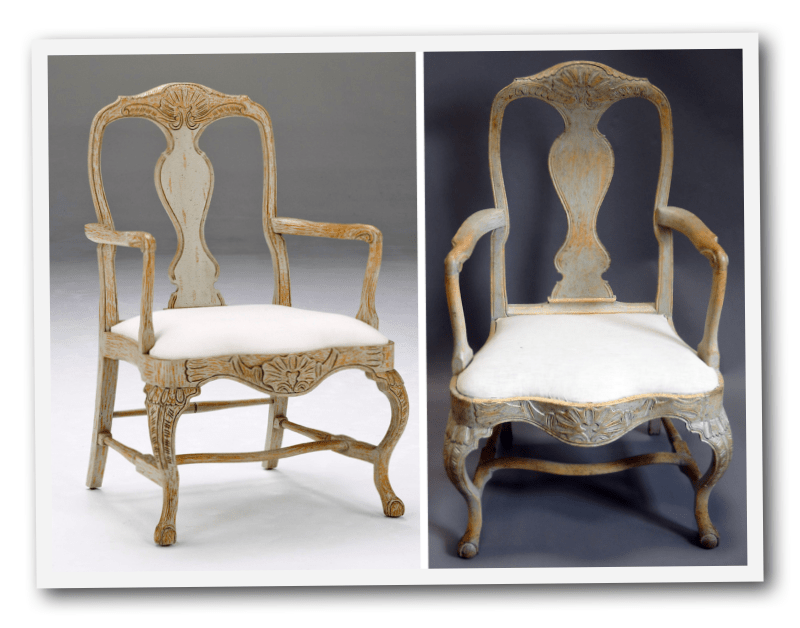 Here he has developed a finish to look just like the original 1790's antique Rococo chair. A lot of hand work is also done on applying the finish to get it just perfect. Every craftsman involved in making Swede furniture is the best in their own specialty. I am so grateful for what they do and couldn't be prouder of them. This Swedish Gustavian chair is having some adjustments made to the back so it has been taken apart. I'm a HAPPY, HAPPY lady! Want lasting beauty in your home or your design project? A few of these chairs in the pipeline to be completed the first part of September have not been spoken for. Since these are individually made, quantities are limited. Send me an email for more information at swedecollection@comcast.net. Showing "Y'all" my project. I missed my first gold metallic canvas that I sold. Had this 48" x 48" canvas that I has purchased last year so decided to throw some paint on it and do one similar to the damask one I sold. Ignore the strange light reflection at the top. It is silver metallic with gold metallic in damask. I used Annie Sloan Chalk Paint in Paris Grey as the primer. As I expected, it worked like a champ. I put it here temporarily in the living room above the sofa on the milk chocolate wall for now, but it will be moved over the gray Swedish console after Thanksgiving as I think it will go much better with a display of mercury glass on the console table. Milk chocolate does nothing for it. Then it will go to the shop to be sold. I like the bigger size of 60" x 48" canvas so will make a bigger one for myself to keep when I have time. I will do it in silver and gold metallic as well. Continuing yesterday's post on manly machines used in furniture making, here are a few more machines. Sure glad my guys are highly skilled with these things because I couldn't operate a one of them. And, here is a pretty table they make with their talent and a few manly machines. My paint finish guy did a fabulous job on this Swedish Gray finish. I'm so proud of all the guys who work for me creating my dreams. Since I'm in the furniture design and manufacturing business, I thought I would show you a few manly machines used in the process. The Adwood machine is an edgebander. Saw on the right. Here we have a miter saw and a dust collection system. And this is what my fabulous team of guys and one gal just finished. I'm so proud of the work that they do. I support original content blogging. I'm so thrilled to announce that fabulous Australian publisher, Coty Farquhar, included a story on Swede in her April issue released today. See pages 11, Swede's furniture style on pages 12-13 and a story about us on 96-100. The April issue is 148 pages of beautiful things not to miss. So many lovely stories about other women as well. If you know someone who would enjoy Coty's work, please pass this along. 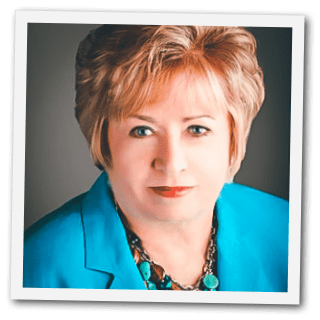 To everyone who follows me, I want to introduce you to the most excellent blogger and publisher of digital magazines on the planet, if you have not already found her, meet Coty Farquhar of New South Wales, Australia. If you've ever wanted to be a photo stylist when you grow up, this is the ultimate place for inspiration. I don't want you to miss the third issue of her digital magazine, due out Tuesday, February 12. Sign up on her blog to receive this magazine Tuesday. Her blog also has links to the December and January issues of the digital magazine. And, don't miss looking at her Pinterest boards. I cannot put in words appropriately how talented Coty is. I have been following her blog for several years and when I see she has posted something new, I have to look at it immediately. Her photography skills are out of this world -- the styling of the photos -- the subject matter -- the commentary -- beyond incredible. Remember that Australia's seasons are reverse of ours here in the US. It is Summer there now, so lots of fabulous flowers are in bloom. Don't waste a minute. Go look at her site. Saturday here was a dreary overcast day. One you normally wouldn't want to get out of bed for. But this Saturday was different. It was one to jump out of bed for. I got one of 12 seats in Amy Howard's workshop in Memphis on antiquing mirror and eglomise. I would even go so far as saying it was a life changing day. Why? Because the class was taught by Tammy Randolph. Glass expert. When I saw this notice in my email, I immediately called to grab a seat and I was the first one to sign up. [Sigh of relief]. This was my third workshop at Amy Howard's and I say the last is always the best, like husbands. Amy and I married our last and best husbands a week apart 20 years ago. Tammy has worked at Artisan Studios for five years. If you see any mirroring work on furniture in the Amy Howard Collection, Tammy did it. From the Amy Howard Collection HERE. Mr. Swede has a saying about getting people to do a project like a brick patio. He says there are technicians and there are artists. Most people could lay brick with instruction, but a brick in the hands of an artist with talent and vision becomes a masterpiece. Tammy is an artist. I can't express how fortunate I feel to be taught by her. Some artists can't teach. Tammy can teach and is passionate about her work and thoroughly knowledgeable. Those are the kind of people you want to take classes from. If you follow my blog, you know I've been to a few classes in my day. This class was on taking purchased mirrors, new or old, and antiquing the mirror. But the real thrill was learning how to do eglomise. Her examples mounted on the wall were stunning. Here are the two products we used. They are $104 through Amy Howard at Home. You will also need a few other items like mica powder, shellac, spray lacquer, old newspaper, paper towels, black paint, a mylar stencil, etc. My first project, you ask? I'm going to start on a few small projects first. I have several antique mirror frames where the original mirror broke and someone replaced it with new clear mirror. Well, they just don't look right. On the one above, after I fix the mirror, I am going to antique the metal frame itself that someone has painted solid gold. It needs some history. Basically, you remove the black paint on the backside with bottle #1 to expose the silvering. If you are familiar with or have used Franmar Soy Gel paint remover made out of soybeans, this is very similar. Then you manipulate the silver layer with bottle #2. Amy Howard at Home has a You Tube video of Tammy with the product, but it is really just a teaser, not instruction of all the steps. The class was a busy full three hours. I highly recommend taking a class even if you are the adventuresome kind as there are so many hints and information that only a master can teach. And, eglomise? Holy Cow that was exciting. I can't wait to try it. Have you ever wondered how this was done? I sure did. The reason this class was what I call life changing is because on Friday I couldn't do antique mirrors [process failed in a former class I took] or do eglomise. On Saturday I did. The way I can tell if I attended a great class is if there are so many creative ideas that come to my head that I can't get them all written down fast enough. And by the time I am driving out of the parking lot, I have already designed products like clock faces, jewelry boxes, framed miniature silhouettes on glass, lamp bases, etc., etc. Thank you, Tammy. Such a thrill. I also want to say one more thing. Those who know me have heard me talk about what I think the number one characteristic is that makes a leader. Courage. Courage to share your talents and teach others what you are skilled at. I said the same thing when I took a class from designer Tobi Fairley in Little Rock. Good businesswomen understand this. Thank you Amy Howard for letting Tammy's talents be known by 12 new people. This new online magazine was just released by Irene Valdirose. You must take a look! Miss Coffee's photograpic skills are just fabulous. I am crazy about attending charity design showhouses. If I am traveling anywhere in the U.S. and find I am near one, I always try to attend. I started attending them in the mid 1970's. I remember the first one I attended in Jacksonville, Florida in the Ortega neighborhood. It had bright hot pink painted walls in the living room. It was shocking. I have never forgotten it nor the Coronado, California Ocean Boulevard 1888 mansion where the designer painted the dark woodwork purple. All the hundred since then still draw me in to see what the latest ideas are. Love the oval windows below. The double-door covered entry is great if your home faces West. It cuts that tremendous heat from the sun. I also like light color coated brick. Sunday I went to see the American Cancer Society showhouse in Memphis, TN built by Kircher-Belz to see what Amy Howard with her assistant, Julie Nicholson, designed [all of the first floor] with her furniture line Amy Howard Collection and sponsored by F. Schumacher Fabrics. Teresa Davis, owner of Post 31 Interiors, here designed the second floor. The builder, Eddie Kircher, was there to greet everyone and show pride in his French-style beautiful home. The showhouse is open Fridays, Saturdays and Sundays until July 31 if you are in the vacinity to attend. And, by the way, I want to mention that 100% of the $20 ticket goes to the American Cancer Society, a very rare occurrence. It is just incredible to me that the designers donate so much time and resources doing a showhouse. I think it is extremely generous on their part. Both Amy Howard and Post 31Interiors have done showhomes in the past. I believe this is the third one that I've attended where Amy Howard contributed extensively and the second for Post 31, whose shop is on Poplar in Germantown. To see my post on a showhouse done by Amy last year, go here. To see a post I did on taking her workshops, go here. There are certain features I look for in showhouses each time. I love to see a stunning bed in a master bedroom, a large lovely dining room, huge kitchen walk-in pantries and fabulous craftsmanship in iron staircases, lots of French doors, fireplaces and built-ins. Homes with 12 foot ceilings seem to be just right for my eye. Shorter is too short and taller is too tall. My husband requires a fabulous kitchen to wow him and his ultimate requirement -- the range must be vented to the exterior. I won't show you the entire home but let me show you some room designs that I liked. Let's look at the master bedroom first. This is my favorite bed, the Keats, in Amy Howard's line. You know I love painted furniture and gold leaf trim and a bed done in white linens. Note the Schumacher fabric on the headboard, drapes and acrylic leg Gloria bench. I love all the neutrals -- whites, silvery grays, creams and beiges. Although framed intaglios have past their in-style heyday, I still think they are interesting and need to reframe mine. I like framed French antique documents also which I found in this home in the living room. Even though I can't read many words in French, the beautiful script, ink and seals intrigue me. I believe all the artwork is represented by L/Ross Gallery here. I prefer white painted wood wide plank floors, but my husband likes dark wood as shown here. With any successful room design, it is all in the details. Here you can see the chandelier and the coffered ceilings. There were a pair of Tate slipper chairs by the French doors with an Avalon cocktail table between them. Here is a closer look at the art. Stanley mirrored nightstands are on each side of the bed. Mirrored furniture is having a long run in interior design, which does sort of surprise me. Of course, the vintage 1940's French pieces are highly sought out. The bedding and pillows are also available at Amy Howard Collection outlet on Perkins in East Memphis. Amy Howard has also opened an outlet in Nashville, TN. The Giometti console cabinet for the television at the end of the bed. I believe the sliding doors are shagreen style leather. In the master bath, Ravello mirrored consoles were used as sink cabinets. The sconces used throughout the house were very unusual including these in the master bath. I do not know the manufacturer. I liked the large gray tiles and the marble around the tub. The Amy Howard spaces are not overdecorated like you see in so many showhouses. Next, let's look at the dining room. I love a large dining room where you can actually put all the leaves in your table, have 12 chairs around it and have plenty of room for cabinets. This dining room is a wonderful size. In my ideal dream house, the dining room is a multipurpose space, however. My philosophy on dining rooms is either make them spacious and 2die4 if they are going to be constantly visible, or put the table on casters and wheel it into a closet when not needed for a dinner and use the space for another purpose. And, who doesn't love French doors. I like the kind that lead out to a private walled patio filled with flowers, fountain and potted trees. Love the neutrals here also and the ceiling design. The Gueridon painted and mirrored cabinet for a buffet on the right and a black painted Wesley armoire on the left. The shine on the rug is where it is taped down for safety. Here we see just a little light blue brought into the room in the carpet and a look at the Wesley china cabinet. Here we see a dining chair with the fabulous F. Schumacher drapery fabric. Shown below, the breakfast room was to the left of the kitchen. And here you can see the light fixture and the beautiful drapery fabric. The dining room, kitchen and living room were open to each other. I consider this a great room effect. This is where the family would really do their great "living". You have balance on both sides of the fireplace with two Maya chests and sunburst mirrors. I liked the fragment lamp and framed antique documents as accessories, partially out of view on the right. The Bridgett coffee table holds a variety of books and is of substantial size. The daybed is placed in front of the French doors, just as I did in my home. The neutral upholstery and carpets give great flexibility. Here is a closer look at the fireplace. The front metal staircase with the architectural remnant figural table. I love seeing these objects used as accessories and given a new life. A Tivoli console used in a hallway. A Madison mirrored console and St. Regis bench in the study. This study could be used as a small formal living room if desired, but I think it would be best used as an office. I would add built in storage cabinets for files along one wall. This study was somewhat remote to the other living spaces. I would have liked to see a large table desk in here with chairs instead of the two banquette-like sofas. I am perplexed about the live chicken/rabbit transfer crate as a coffee table and assume that it was some kind of inside joke we weren't privy to. The blue dyed carnations and green Boxwood under both windows (ouch!). Love the Schumacher fabric on the throw pillows. Overscaled floor lamps. There were many other nice features to this home, too numerous to show you all of them. Let's go upstairs now and see the spaces designed by Post 31. This is the first bedroom. Lovely linens and a large wall mirror. Great for guests or a mature older daughter. Distressed chest and a lantern filled with collectibles. Contemporary floor lamps on both sides of the tufted headboard. Second bedroom upstairs with the gold metal bed and luxury linens. 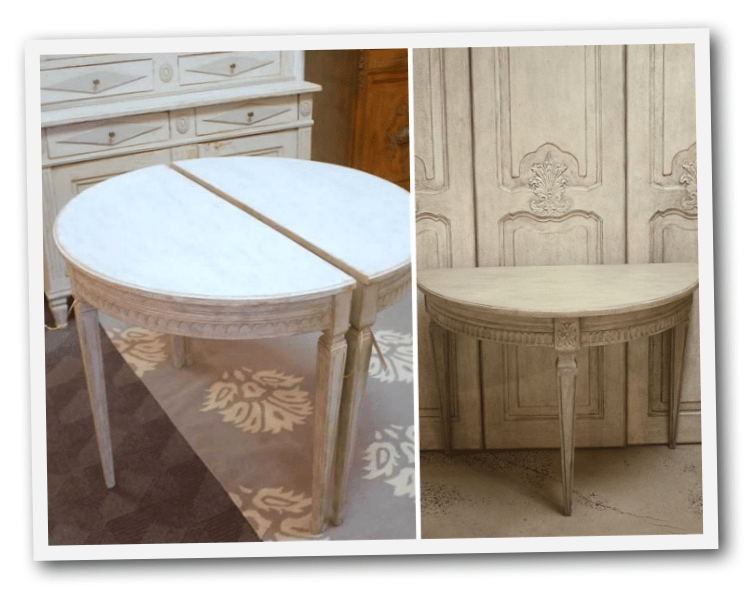 Demilune table and mirrored door accessories. Seating area at the foot of the bed with the metal drum tables. I really liked this room with the dormer window which would be great for a bedroom for an older boy. These display cabinets lined the walls between the bedrooms. The home is for sale by River City Land Company at $889,000. It is 4869 square feet with 4 bedrooms, 4.5 baths with a three-car garage located at 5254 Winestone Cove, Memphis. For sales information on the home: 901-756-0808. Hope you enjoyed taking a look at this showhouse with me. Amelia, since you may be wondering, is an occasional chair frame in the Amy Howard Collection. Amelia Chair The Amy Howard studio is in Memphis, TN. In January 2011, Amy began offering painting classes held at her East Memphis outlet. I was so thrilled to be able to attend and learn her painting techniques. The hands-on workshop at Amy Howard is actually the third class I have taken there. In the photo above, you can also see a chest I painted a couple years ago in a taupe metallic finish. Also shown are some demijohns brought back from France that my husband and I selected at Roundtop antiques show in Texas this spring. I liked the aqua ones and he liked the green ones. Behind the demijohns is an original painting that I did. The photo is cropped so you can't see much of it. The first class I took in January was on creating the Toscana finish with gold leaf edge on a small piece of wood. This class is doing that finish on an actual piece of furniture. Students had a choice between two different chairs or a bench. Another student in the class, Sam, and I picked the Amelia chair and Beth chose the bench. I took this photo outside so maybe you could see the finish a little better. It is so dark inside the house. The fabric is a cocoa colored linen with a gold metallic painted damask pattern. If you are within driving distance of Memphis, Tennessee and love to paint furniture, I suggest this class. It was not taught by Amy herself but by Lauren who she trained and Ned who is very talented and works at the studio. His instruction was invaluable. Thanks, Ned. Here is the raw wood frame that I started with. I know this sounds crazy when you want to end up with a light painted piece, but the first step is to stain it. Just one of the layers to get to the end result. Then the legno gesso. Then water based paint. Here Ned is quick drying it with a torch. Here fly speck aging has been applied and Ned has distressed the frame with a scraper. Red boulle water based paint has been placed where the gold leaf will be applied. Here I have started applying the gold leaf over the boulle paint. The gold leaf is now on. The last step is adding light and dark wax and some dust of the ages. This photo shows how the wax brings out the aging. I loved this wax but on a future chair, I would not distress it by scraping back the paint so much. Students are having a fun time. For information or to sign up for classes, contact Lauren Stone at lauren@amyhowardcollection.com. For information on purchasing furniture at the outlet, contact Amy Hyneman at amy@amyhowardcollection.com. Now that we have finished class, do you want to walk around the outlet with me and look at some Amy Howard Collection pieces? I'll show you some of my favorites. The versatile Darnell chest used beside a bed. Lots of different style chests to pick from. Lots of mirrored pieces to select from. Including this four poster bed and chest. One of my favorite beds. It would be hard to choose. So many lovely pieces. Did you see any you liked? I'm awaiting the new workshop list to see if there is another class that excites me. Can you envision this turquoise and gold on your powder room walls? Are you curious how this is done? Have you ever wanted a silver drop dead foyer? Would you like your artwork frames to look nicer? Ever wanted kitchen cabinets 2die4? Does this cabinet door lift your spirits every time you see it? Or maybe you love an oriental look. Ever wonder how this is done? Does this take your breath away? Can you imagine where you could put these? Does this make your heart pound faster? Let this lovely lady teach you how to make your home expressly unique. You will love the endless possibilities of how you can change your decor yourself. I've loved every minute of the three classes I have taken here. The instruction is supurb. I only wish I had discovered this Institute years ago. The fun awaits you! Annie Sloan of England brought her Chalk Paint to the American market. Formerly only available in Europe, the formula is now produced and distributed in Louisiana. This workshop, taught by Brit Annie Sloan was to introduce her paint line called Chalk Paint to American painters. As the old addage goes, "necessity is the Mother of invention", Annie created Chalk Paint to get the desirable properties in a paint where others failed to perform to her liking. What is Chalk Paint and how is it different? In Annie's words, this water-based paint available in 24 colors is a soft matte paint for use on almost anything to allow the user to work in an independent, intuitive and creative way. 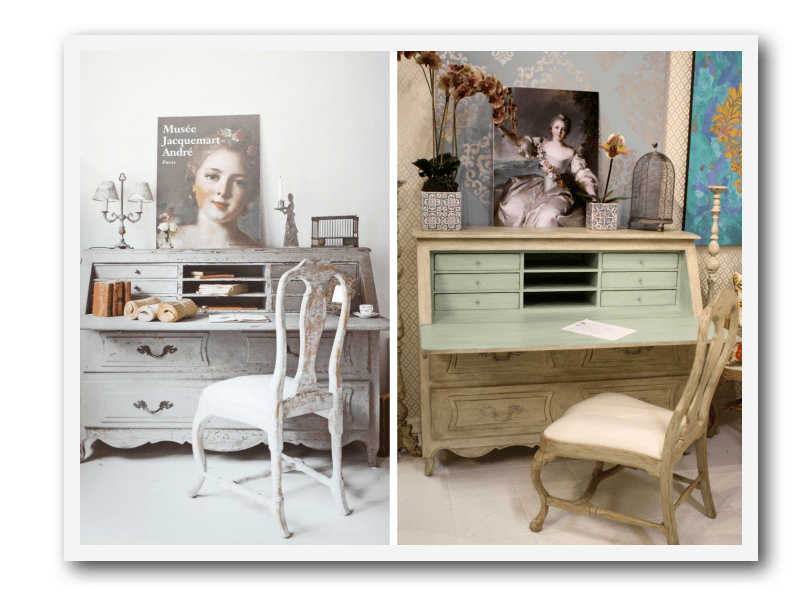 You can create a distressed French or Swedish look, a plaster look, a washed wood look or even do a blackboard. Each of the 24 colors can be expanded to more colors by combining paints. This storyboard shows examples of fabulous applications on furniture, walls and doors. Love that door on the right. I guarantee you this is not difficult. It is a lot of fun and you can do it too. Students in the class ranged from professionals who make their living faux finishing to students who had never painted before. I'll walk you through a few of these techniques. The first one is the Two Color Technique on a piece of egg and dart molding. The secret here is the English wax. Clear always goes on first. Wipe off excess brown wax to suit your taste. Below is what the Hannant's wax looks like. Next, sand through to expose the underlying color. You can distress as much or little as you like. Here's the end result. See, how easy was that. With a little instruction, you can paint anything. Let's walk through another one. This is my favorite called Clouded Stipple. Versailles is the base coat. Then dapple on small amounts of Old Violet and Old White with the tip edge of your brush and merge to make cloudy. Brush on sizing and let get tacky. Then apply the gold leaf sheet. You can also remove some of the brown wax by using another coat of clear wax. I won't run you through all six finishes step by step. Here are some random shots of the Textured Colored Wax, Textured Paint, Crackle Paint and Lime Look Wash. Wipe off as much or as little of the brown wax as you prefer. That was easy, wasn't it? Here are various finishes you can create with Chalk Paint. And here are photos of the class. I hope you enjoyed your class with me in Brandon, MS via this post. If you would like to take a Chalk Paint class, the next one at The Southern Institute is April 15. When I went to the December show at Scott Market in Atlanta, I met Mary Robertson of Shell Art & Design. I wanted to show you some of her work. She said she is showing pieces of jewelry and shell decorative accessories at the Jacksonville Beach Museum, in Jacksonville Beach, Florida until January 6th if you are close by and want to see her work there. This is a lidded box with the shells afixed. She attaches the shells to sconces, statues, picture frames, lamps and mirrors. I'm sure you have seen books published the past few years on Shell Chic interiors. I still love decorating with white natural coral and some large shells. In the past couple of years shelter magazines have overdone the look and some say it is a trend that has gone. To me my coral pieces are everlasting and a room can still be beautifully done with shells as accessories if not done to extremes, as with any trend. Mary's business card does not have an email or website, so I can't give it to you. I do have her phone number if you just email me. All the best on this early Janaury Sunday. Can you believe my excitement when I read my email announcement that Amy Howard is going to conduct workshops starting in January in her Memphis shop?? Wow! I have been waiting for this good news. I immediately called and signed up for two of the three classes she is offering. I am so excited! I immediately recognized in the above announcement the aqua chairs in the back row. I wonder if she will teach that finish. Here is one of two of her chairs I have in my home office. My office is currently decorated differently but the chair is still there. You might also recall I did a blog post on Amy Howard's furniture in a showhouse on July 6th. You can see more of her line at amyhowardcollection.com, but she doesn't picture all her products. I would suspect this is from problems like other companies have of knock offs being made. Amy also has a blog which can be accessed from her website. Can't wait to tell you about my class in January. I want to share with you a very fun class I took in Time Aged Finishes at The Southern Institute of Faux Finishing, http://www.fauxfinishbiz.com/, in Brandon, MS the first of July. It was about a 3.5 hour drive south of the Memphis International Airport through the very green landscape of rural America. Brandon is near Jackson. This was my first class in faux finishing although I've experimented and tested some products and attended demos in the past, some were failures, some with okay results. I won't mention my Venetian Plaster episode. Over the past few years I have painted quite a few furniture pieces; a queen Baker bed, Karges console, John Widdicomb desk and chests, Henredon table desk and chest, etc. I will do a post and show you before and after of those sometime. Generally, I purchased French pieces made by these makers on eBay because of the quality of manufacture. Karges and Widdicomb are just tops for quality. If I am going to put my time in on redoing a piece of furniture, I want to start out with something that needs updating but is not junk but is not a priceless antique on the other hand. These pieces were built to last. I've gone through my phase of re-dos of older pieces and am now only painting new ones. So, I attended this class to learn more about painting new furniture with an aged patina. I am always a little unsure about signing up for classes with a concern for disappointment in the instruction. Believe me, I was not disappointed!! If you have any hesitation about the kind of instruction you will receive at the Southern Institute, don't hesitate! I would say I have high expectations when it comes to paying for instruction and my expectations were exceeded. I could not have been more pleased with the entire experience and I highly recommend this Institute for the quality of instruction and the overall experience. In this class we did six different aged finishes on six-inch moulding boards. The paints used were Faux Effects International silver line which are sold at the Institute. Candela and all the supplies. In the front of the studio are samples of finishes for walls as examples of boards that a student would prepare in other classes. The second one from the right was 2die4 -- so unique. An easel full of boards you can look through for ideas and examples of the wonderful looks that can be created. I believe this was a stencil. Very lovely. Of course, you would expect the walls of a faux studio to be painted. Here are some of the hallways and walls. Notice how the switch plate was done. On the back wall of the studio were samples of kitchen and bath cabinet doors and furniture finishes which are covered in another class. I just loved these cabinet door finishes below. My favorite is on the upper left. Hard to choose when there are so many fabulous options. I also liked the mercury glass one which is second from the left on the top row. Here is a close-up of the one I liked with the gold in it. Virginia said she designed a special tool to do this finish. Here are a few samples I pulled out of the pile that attracted my attention. Italian finishes of green and gold are always at the top of my favorites list. I just loved this. Even though I love a white or neutral Swedish room, these blue-green pieces just steal my heart. Here are a couple of the paintings on the studio walls over the prep sinks. This silver panel's texture was incredible close up. Virginia told us about a sale on fireplace over-mantles at Lakeland Moulding near Flowood, MS like the one she has here. I went over and purchased one a little smaller than this. Now to decide what color to paint it and take a class in antiquing mirror glass. There are many classes taught at the Southern Institute by Virginia Weathersby each month. I signed up to return for a class in August. The first thing I noticed was how strikingly beautiful Virginia is in person. Move over Gwyneth! And, more, she was lovely, extremely knowledgeable, very experienced in her trade, has a great artistic ability, a wonderful teacher who is willing to share her talent including all tips and tricks and trade secrets. Her mother was there helping as well as her assistant, Candela. The studio can seat probably 20 students, but we were lucky in that we had a small group so received nearly private instruction. When I showed my husband the photos, he said, "Looks like all you did is eat!" Can you believe that Virginia made a fresh Tomato Pie and Giant Stuffed Mushrooms for us for afternoon break! The Tomato Pie was fabulous, and she was kind enough to give us the recipe. Remember, a tomato is a fruit. Oh, this was sooooo good. It was a very fun experience and I look forward to my next class. All the best to you, Summer. The Vesta Designer Home Showcase in Memphis, TN is awaited each year by many to see the latest products and features in interiors and home building. Over the past 25 years or so, I have attended designer showcases on both coasts and in the middle. I love visiting showcases whether new structures or old homes with a new lease on life. The 2010 Vesta Showcase had five new homes but I am only going to show you one. Adult admission was $12. This home built by Eddie Kircher and Marc Belz called the Cottage Garden is 4,225 square feet, not at all a McMansion but a very livable family home. The interior decorator is listed as David Anderson of the architect's office, T. Douglas Enoch Architects & Associates. The home is nearly entirely filled with furniture from Memphis furniture maker Amy Howard. Website is www.amyhowardcollection.com. This is an English Arts & Crafts style home and it shows how versatile Amy Howard furniture is to go just as well in these cottage interiors as a more formal home. Normally only sold to the trade, the public can now obtain pieces from her line at her outlet opened last October at 420 Perkins Extended, Memphis, TN 38117, phone: 901-682-2558. If you have the opportunity to visit the outlet, ask for sales associate Madeleine, a lovely and helpful lady. I believe the Madeleine chairs are named for her. Most of the pieces shown in this home are from the Amy Howard Outlet and carry the outlet price tags. Having been an Amy Howard fan for many years, I stumbled upon the outlet while going to David Kidd bookstore across the street. I purchased two Louis XVI sea-foam painted oval-back bergeres which I will show in a separate post. The Garden Cottage home is located at 7634 Neshoba Road in Germantown, TN. Walled brick courtyards are a favorite of mine. This was home number one on the tour. I knew I was in for a treat when I entered the front courtyard and saw a large French pot with a very familiar price tag hanging from it. Since all the furniture in the home was for sale, you will see price tags hanging everywhere. Here is the staircase. Understanding this is an Arts & Crafts cottage, my heart is still with metal staircases, so I would have chosen differently here using an iron one in the A&C style. White walls are used throughout. Notice the double silvered closet doors to the right of the front door? Just love those. On Amy Howard's blog Amy Howard Daily she discusses making mirrored glass in their shop. I'm sure this must be hers. Here's another photo. Also like the cocoa-colored paint on the doors. The mirror is heavily antiqued. From the foyer you go through the archway into the dining room. For this showcase the dining table was covered with a burlap cloth and used for brochures with the dining chairs pulled back to the corners of the room. Do notice the beautiful chairs though. Flagstone foyer and dark wood floors. Amy's light fixture hangs over the dining table. Wood ceiling beams are stained dark. I love the tone-on-tone drapery fabric. The table in front of the window is too small. Amy's Mimi Console would look great here, but alas, it was sold. Here is another look at the drapery fabric. There is only one gathering room in this home which is the living room between the dining room and the kitchen. Acrylic side table and Madeleine chairs on sea-grass rug. Painting over the fireplace must be by Nancy Stephenson as her card was on the table. Here is another painting in the foyer that is of similar style. Most families would add a sofa to go with the four chairs. Contact Nancy Stephenson at brushmarkgirl@yahoo.com. Here are more detail views of the living room. Fabric on the chair has a burlap appearance. I love gold trim on furniture and the neutral colors. Above you see two wing chairs from Amy Howard Collection and wood-toned occasional tables. Not all of her product line is shown on her website. I do like the artwork placed above the arch opening. Below you are looking from the kitchen into the living room. The glass wall looks out onto the covered porch. In front of the window is an acrylic console table with Amy's metal mesh benches underneath. Black painted coffee table from her line. Above is a sleek acrylic table with Amy's metal mesh upholstered stools. While we're here, let's step outside onto the covered porch. The corner drapery panels are made of beige canvas painter's drop cloths from Lowe's sewn together. Flagstone patio. Amy Howard Collection table has a zinc top. Going back inside, let's look at the kitchen. It is a surprise to not have a kitchen island built to the floor with storage cabinets underneath. Here a wood-based table is used for a more open look. There is a small pantry off the hall. I would need a lot more storage. The refrigerator door, not shown, blended in very well with the cabinets on another wall. Here is one of Amy's mirrors over the stove. I am a strong advocate of industrial-sized vent hoods vented to the outside. Should be a requirement for all kitchens. Here the cabinets are white. I love light colored cabinetry and am happy to see less dark stained wood in the new homes. Here you can see those lovely silvered glass coat closet doors. Notice for the cottage look the walls are covered with 1x4 white painted wood boards. From what I could tell they did not appear to be tongue and groove. I noticed how nicely they were mitered on the corners. Down the hallway is a small bath and the laundry. Now lets go visit the master bedroom and bath. Here we see Amy's St. Regis stools at the foot of the Acanthus bed which is painted cocoa brown. You can also see framed intaglios which are available at the Outlet. A line of luxury linens is also available at Amy's Outlet. Across from the foot of the bed is Amy's Selznick dining room server topped with her Grossetto Torches. Don't tell anyone, but I put Grandma Edith's dining buffet in our master bedroom also to hold my collection of table linens. This is Amy's Serpentine Commode painted in aqua tones. There was another unfinished one in the study. Notice the sconces. Salvage iron lamp. More Madeleine chairs and metal table in the master sitting area. Notice the shape of the ceiling with the board trim again. Split double sinks, pretty tile floor, and wood trim on the ceiling again. Large shower. The master closet had a desk. It would be too dark there for me to use it. I do like the carpet though. The study next door can be used as a guest room as well by adding a bed or placing a Murphy bed on the wall. Amy's two wing chairs again and drink tables. Just when I think Zebra rugs have come and gone, I see another one. Joni Webb has discussed Zebra rugs many times on her blog Cote de Texas. I have this metal acanthus sculpture and painted it gold. I like objects with metal leaves. Here it has been made into a lamp. I do not know what the art piece is on the wall. This piece of art is at the top of the stairs. The doors into the home theater are barn doors. Notice the 1x4 wood on the walls again. Inside the theater room are four bunk beds which was a great idea for guests of children to stay after watching movies. It was too dark in there to get a good photo. This room is called an office but would make a great computer study area for kids. It acts as a hallway to two more bedrooms. Outside of the two bedrooms is this vestibule. Notice the 1x4 wood boards on the walls again. There was another bedroom used as a home gym and then this bedroom done in brown for toddlers. I did not understand the plaid brown fabric wrapped around the frames of these low beds. I don't think they are part of Amy's line. I hope you have enjoyed your tour and seeing the Amy Howard furniture pieces in this style of home. All the best wishes, Summer.